Meet the new member of the electric BMW i family previewing a future Tesla Model S rival. BMW has pledged to launch as many as 25 electrified cars by 2025, 12 of which will be all-electric, so we can expect to see its family of electric i cars rapidly expand in the coming years. As we thought, the Bavarian automaker has revealed a new electric car at the Frankfurt Motor Show, but it isn’t the rumored i5. Instead, BMW has revealed a concept car dubbed the i Vision Dynamics to preview an upcoming production model positioned as a four-door Gran Coupe that slots in between the i3 and i8. Of course, this could still preview a production i5, but BMW hasn’t hinted when that’s likely to happen. “Here, visionary solutions and future-ready concepts become reality for the first time. 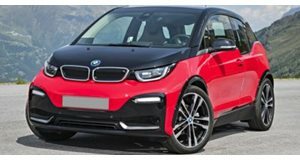 But BMW i also acts as a spearhead of innovation for our other brands,” said Klaus Frohlich, member of the board of management at BMW AG, Development. “The BMW i Vision Dynamics allows us to show right now what another electric BMW might look like. And BMW has demonstrated its talent for turning visions into real life throughout its history.” No technical details have been revealed, but the BMW i Vision Dynamics is powered by an electric powertrain allowing it to accelerate from 0-62 mph in four seconds. It’s capable of reaching a top speed of 120 mph, while the battery provides a maximum range of 373 miles on a single charge. “The BMW i Vision Dynamics is combining electric mobility with the core values of BMW: dynamism and elegance,” Adrian van Hooydonk, Senior Vice President BMW Group Design, explains. “We are therefore demonstrating how the product range and the design language of BMW i can be evolved further into other concepts.” Compared to the leaked i5 images, the i Vision Dynamics has a sleek, coupe-style shape with barely visible panel gaps, retractable door handles, and flush integration of glass into the main body to create a seamless look. A long wheelbase, short overhangs and a sloping roofline also enhance the concept’s styling. A full-length glass surface runs from the windshield to the rear window to create a roomy atmosphere for passengers. At the minimalist front end are slim LED headlights positioned above BMW’s signature kidney grille which, like the X7 iPerformance Concept, has been enlarged. Since it doesn’t need to provide cool air to the powertrain, BMW says the grille serves as “declarations of technological know-how” with underlying sensors that turns it into a “intelligence surface.” BMW hasn’t said what function these sensors serve, but it seems likely to be related to autonomous technology.